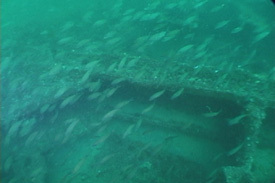 The Dixie Arrow was a 468 foot tanker that was sunk off Cape Hatteras, North Carolina at the start of World War II. On March 26, 1942, she had the misfortune of crossing the path of the German U-boat U-71 who torpedoed and sent her flaming to the bottom in 90fsw. 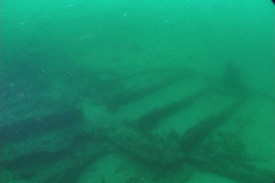 Although badly broken up the wreck, the shifting sands can often reveal new discoveries. 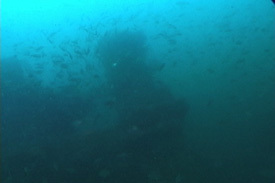 The wreck’s shallow depth makes it easily accessible and home to marine life including the Cape’s prolific sand tiger sharks. 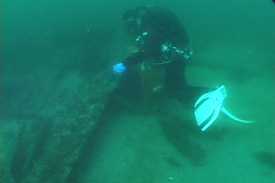 (l) Andrew D. looks for artifacts; (r) Fallen bulkheads from the hull. (l) One of the holds; (r) One of the steam engine's pistons . 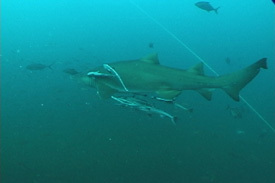 Sand tiger shark and remoras patrol above the wreck.